The first building in which Mass was said in Violet Town was a building erected on the property of the late Mr and Mrs Underwood on the Hume Highway, the site today is the home of the grandson, Mr T.P. Underwood. The building, used by all denominations, was known as the Court House. The Rev. Father Scanlon travelled per horseback from Beechworth, and Mass was said two or three times a year, mostly on week days. That was in the years 1860-70. With the arrival of the railway, the town shifted to its present site in 1872. An old slab building, with shingles on it and papered walls, known as the National Bank, situated near the railway line, close to the present site of the Police Station, surrounded by gum scrub was the next building used for the saying of Mass, the priest travelling from Wangaratta per horseback. With the increase of worshippers a meeting was called to discuss the erection of a church. A site was procured and a wooden building was erected thereon. This chapel served upon a site near the present church until sufficient funds were in hand to erect the building near the station today. With careful planning and much hard work the present church was opened free of debt by the late Archbishop Revelle in October, 1898. The cost involved amounted to £1200. The Rev. Dean Davy offered to marry the first couple in the new church free of charge, and Mr. and Mrs. McHugh, of Benalla availed themselves of the offer. The old wooden church was removed to Rothsey, and still serves as a place of worship in that district. The explorers Hume and Hovell passed through the North East of Victoria in 1824.They were determining a land route from Sydney to Port Phillip Bay and passed through the area where the township of Violet Town now stands. In the Spring of 1836 Major Thomas Mitchell made a more detailed survey of the area and within a couple of years white settlers had moved in with their sheep and cattle.They also brought their religious beliefs and spiritual needs. The Catholic Church was not slow to respond to the request for spiritual sustenance and visiting priests were sent from the fledgling diocese of Melbourne. With the passing of the years Violet Town was successively in the pastoral care of the parishes of Kilmore, Beechworth, Wangaratta and Benalla. Each parish in turn sent priests to celebrate Mass, baptise, officiate at weddings and bury the dead. In 1874 the diocese of Sandhurst was established as a suffragant of the diocese of Melbourne. 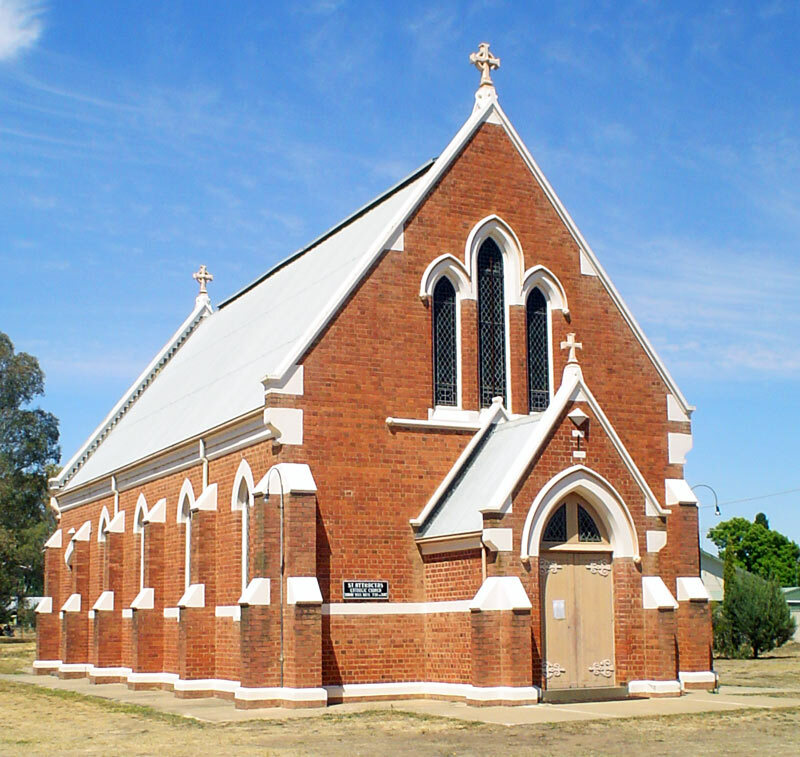 Violet Town now became part of this new diocese and part of the parish of Benalla. A wooden Church had been constructed in Violet Town during this early period but it soon proved inadequate. It was replaced in 1898 by a magnificent brick structure, the present St Attracta’s. Violet Town remained within the parish of Benalla until January 1971 when it was transferred to Euroa. St Attracta’s first hundred years has witnessed generations of faithful worshippers.